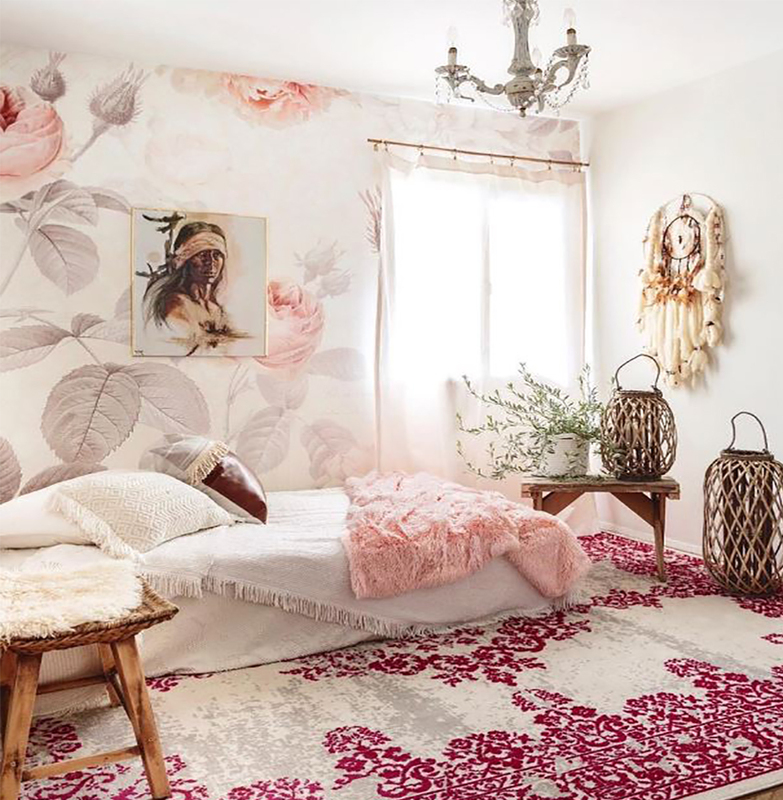 Flowers bring so much life to a space and are equally as captivating in any room of the house, from the kitchen to the bedroom and even the bathroom. 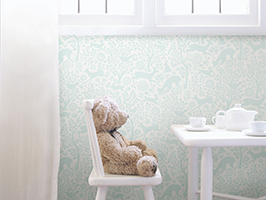 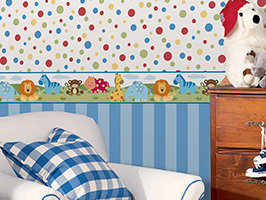 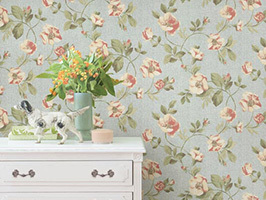 Floral print wallpaper draws on the beauty of fresh flowers, with the freedom of artistic expression. 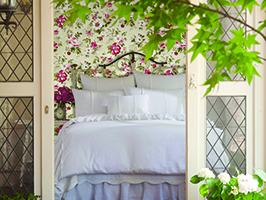 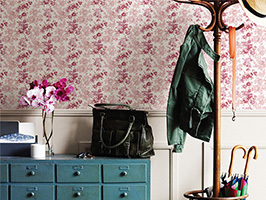 Throughout fashionable times, and continuing to trend, flower wallpaper is one of the most coveted styles. 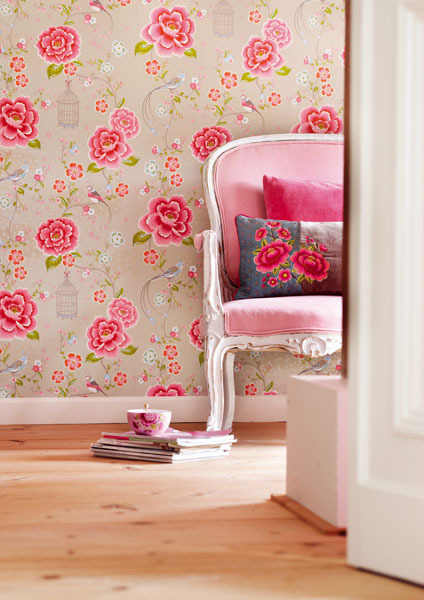 Vintage florals are making a resurgence, and modern floral wallpapers bring an a la mode flourish to the traditional looks. 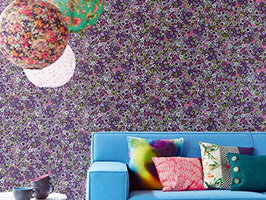 From lush florals that add a vivid and tropical allure to a space, to stylish French florals, art nouveau swirls and clean contemporary takes on the flower motif, a floral wallpaper epitomizes beauty on your walls. 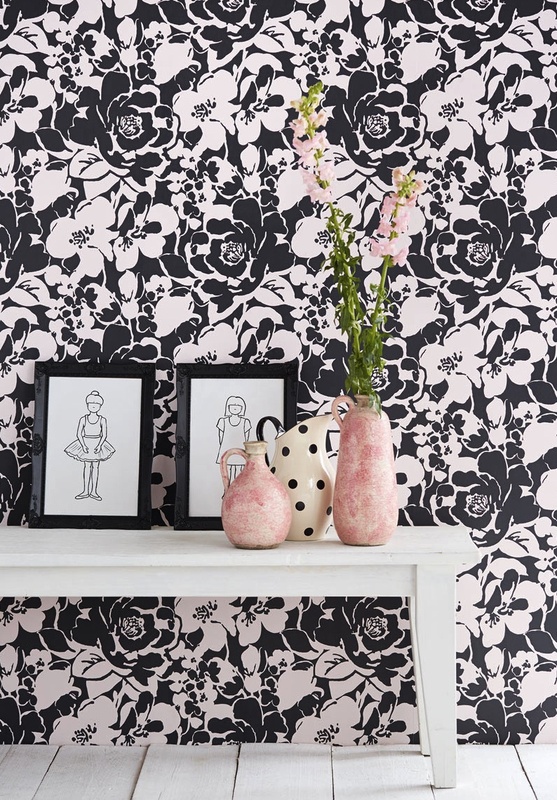 You can romance a room with pretty petals, invite a global-chic cultured look with a Chintz or Jacobean, or dazzle with a sophisticated modern flower pattern wallpaper. 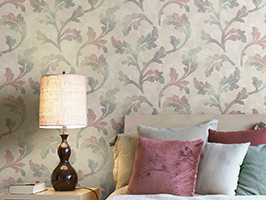 In every hue of nature, wallpaper florals celebrate the beauty of the blossom with a diverse spectrum of designs. 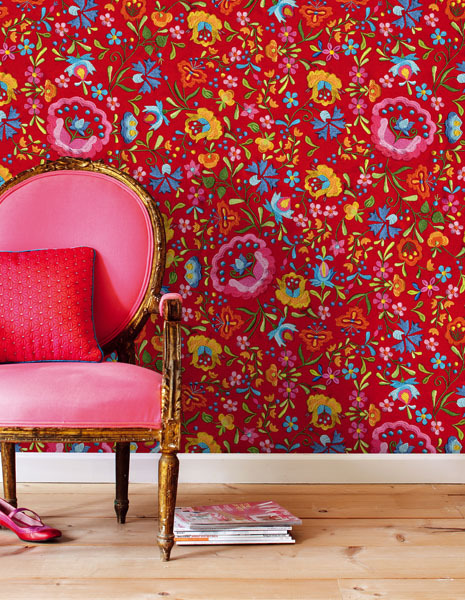 Gorgeous Red Wallpaper with an embroidered look from Eijffinger’s Pip Collection. 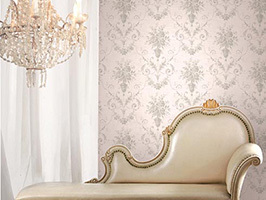 Cultured, with a vintage feel brought up to date with vivid colors and a high fashion allure. 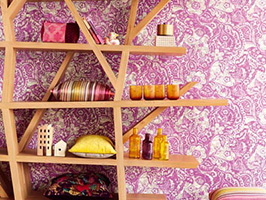 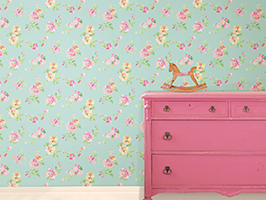 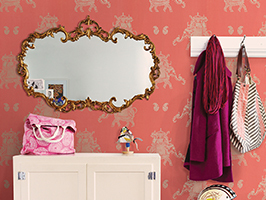 Pink Floral Wallpaper from DecorLine Accents Collection. 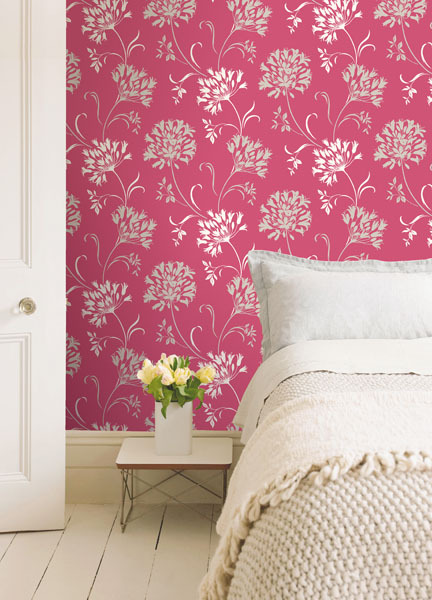 A bright pink design with a graphic punch and chic texture effects. 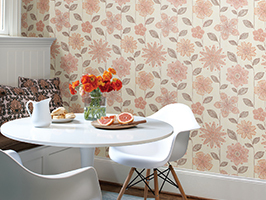 Orange Floral Wallpaper in a Kitchen from Kenneth James Echo Collection. 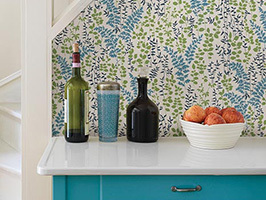 A fresh and modern floral silhouette design adds a splash of vibrant beauty to this kitchen. 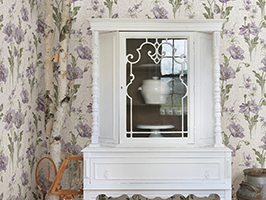 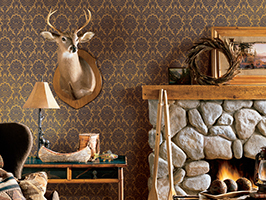 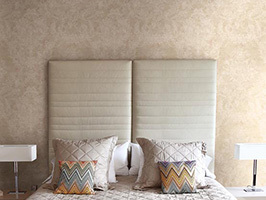 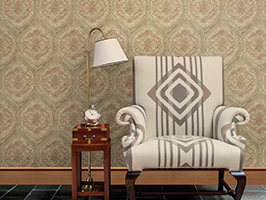 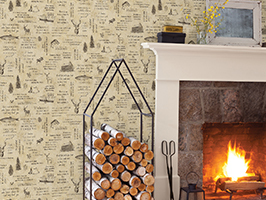 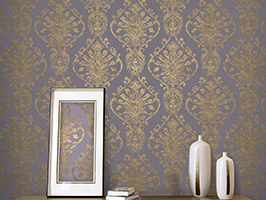 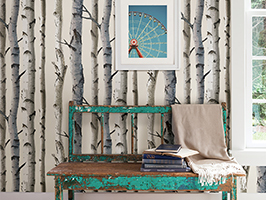 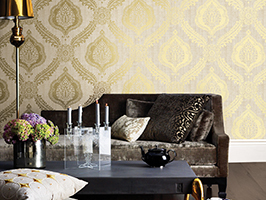 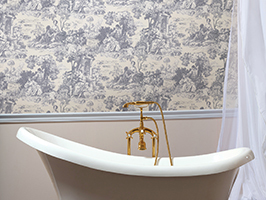 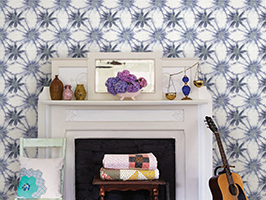 Retro Floral Wallpaper from Kenneth James Echo Collection. 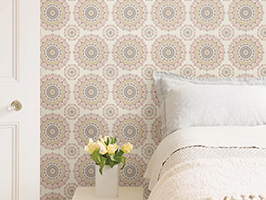 A mod take on a retro print with a chic grey and yellow palette. 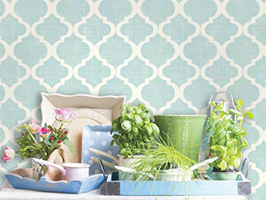 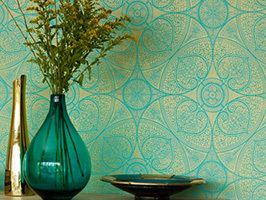 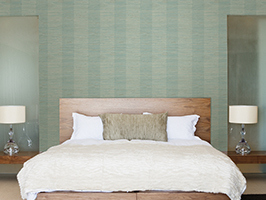 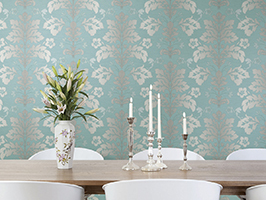 A modern floral wallpaper from Kenneth James Echo collection in a playful palette of blue and green. 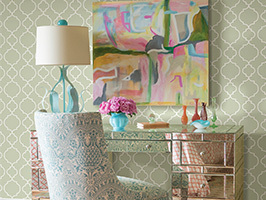 Resort-chic with contemporary stylings. 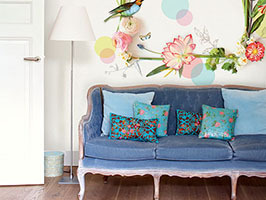 Fresh fun and vivid! 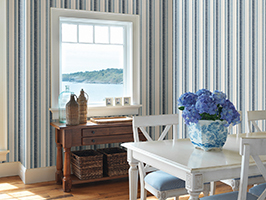 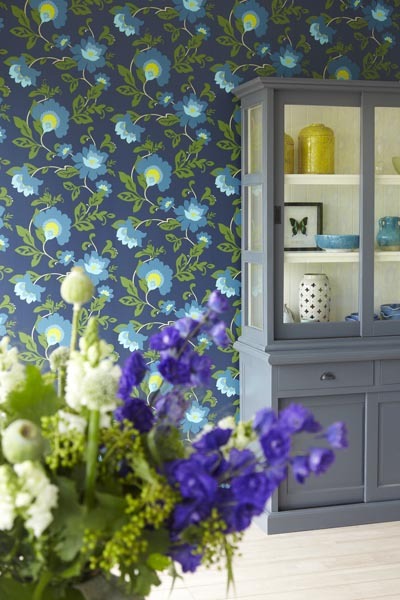 A beautiful blue floral wallpaper from Eijffinger’s Fleurique collection. 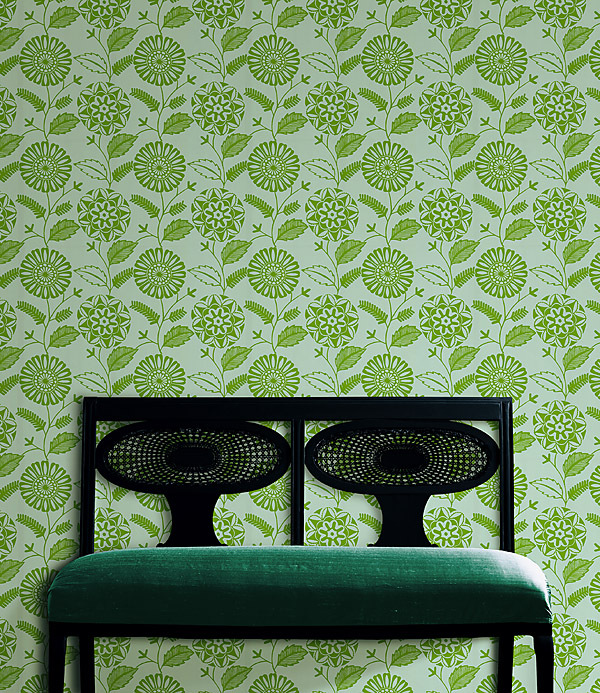 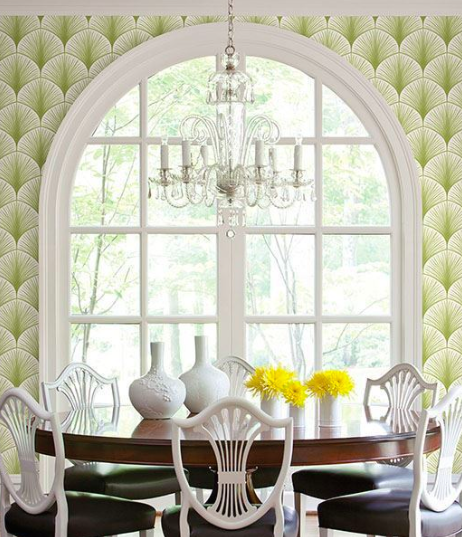 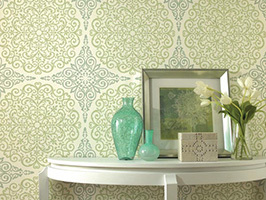 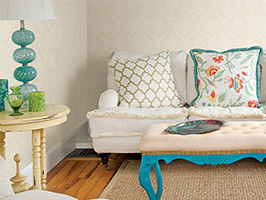 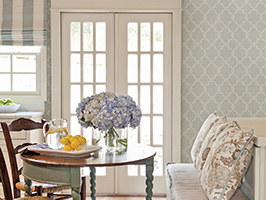 With vintage inspiration and a modern scale, this beautiful flower wallpaper adds a pop of color! 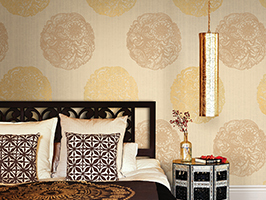 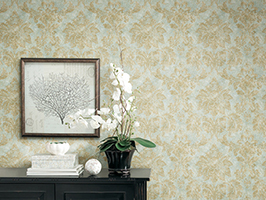 A Japanese floral wallpaper from Kenneth James Luna collection. 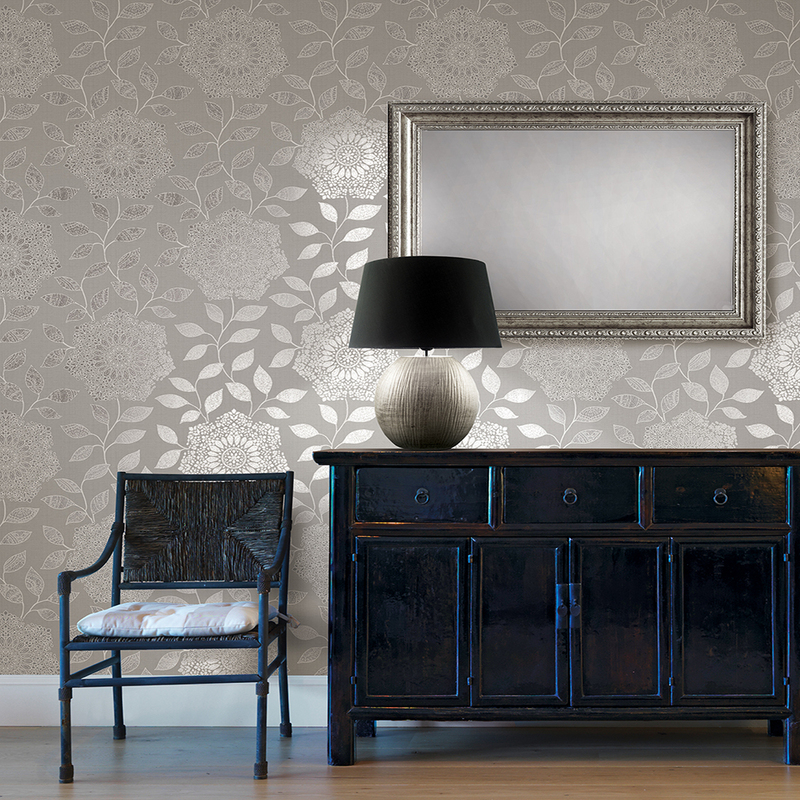 Metallic ink accents, traditional brush stroke art and a chic sterling palette give this flower wallpaper a cultured beauty. 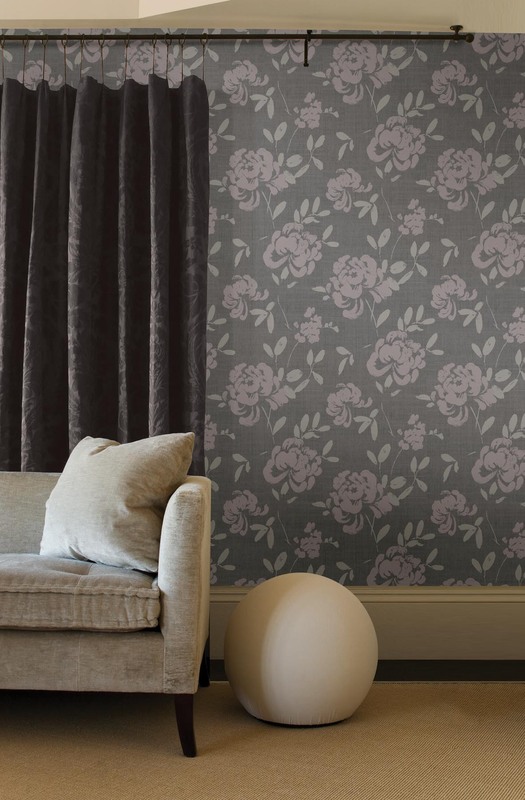 A striking modern floral wallpaper from the Beacon House Ink collection with a French inspiration. 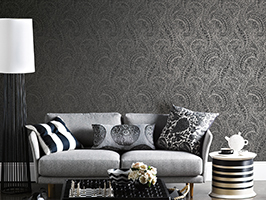 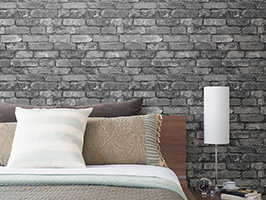 Glossy gel inks add contrast to this striking black wallpaper. 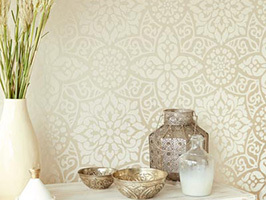 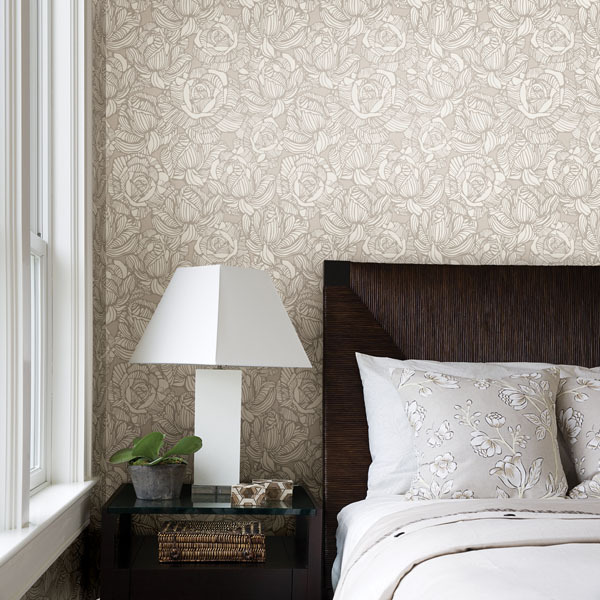 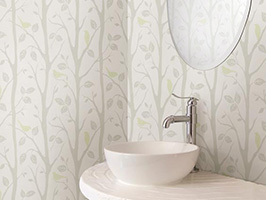 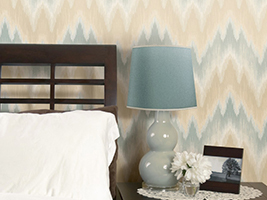 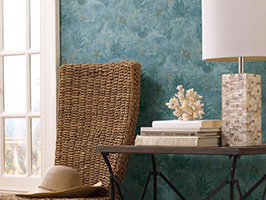 A modern floral wallpaper from the Beacon House Zinc collection. 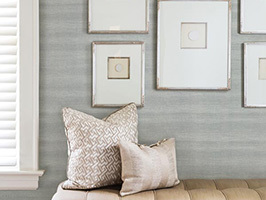 Fresh pearl hues under taupe suede accents add a fashionable and romantic depth to the contemporary design.